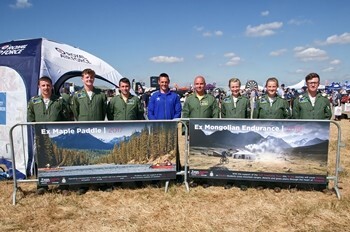 Students from the East of Scotland Universities Air Squadron (ESUAS) have travelled to the Royal International Air Tattoo to personally thank the RAF Charitable Trust (RAFCT) for awarding them £15K. The Trust awarded ESUAS the prize money after their compelling 'Dragon's Den' style pitch on why the Trust should fund their 16-day expedition to Mongolia. Sgt Lee Powles said: "We do adventure training all year round but the places we can travel to are constrained by the funds we have available. "The support that the RAF Charitable trust gives us means that we can actually be stretched even further". To apply for the award, university air squadrons must describe an adventurous training or leadership development expedition that, in the opinion of the RAFCT Judging Panel, demonstrates the best spirit of adventure, enterprise and challenge. The award gives an annual prize of £15,000 to the winning university air squadron and £10,000 to the runner up. Fg Off Neil Herron, former ESUAS member and 2016 award winner said: "The expedition gives us the experience in planning, preparation and managing risks out in real time." Sqn Ldr Johnny Finbow OC ESUAS said: "ESUAS are the proud and grateful winners of the inaugural Paul Bowen Award, first set in 2016, and therefore appreciate first-hand what a tremendous prize the PBA is." The Paul Bowen Award recognises the co-founder of the Royal International Air Tattoo and his 33 years of dynamic leadership of the event. The Judging Panel included AVM Chris Davison, Air Cdre Andy Sudlow, Mr Guy Bowen, son of Paul Bowen and RAF Charitable Trust Director, Justine Morton.